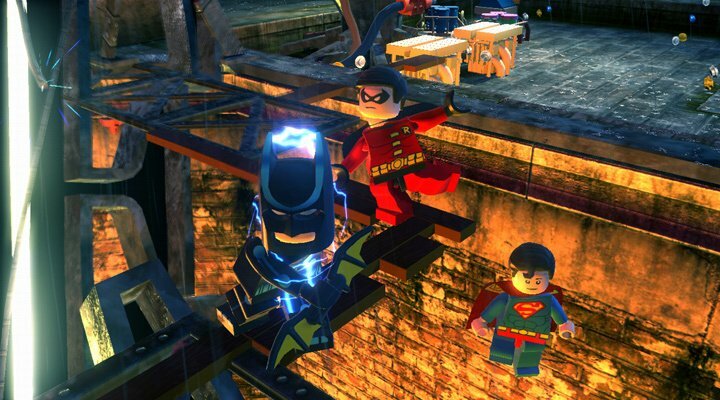 LEGO Batman 2: DC Super Heroes on Wii U finds itself in an unenviable position. Released last year to critical acclaim and heralded as a new beginning to an increasingly stale series of games, it is only now releasing on Wii U, a system that has recently played host to what some consider the new pinnacle of LEGO games, LEGO City Undercover. 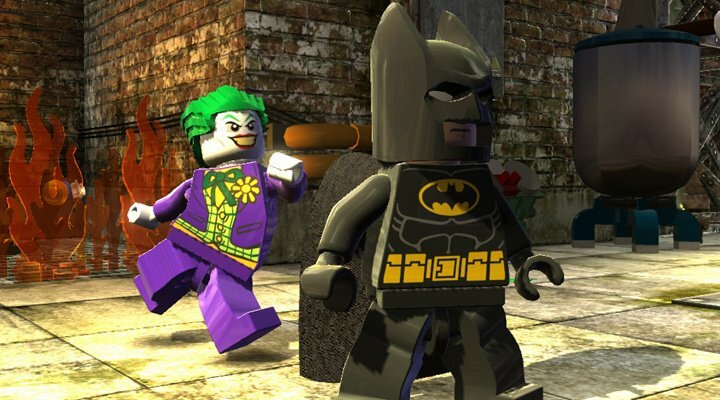 Following on the back of such a warmly received title, LEGO Batman 2 is now not only under pressure for being a year-old port, but also from its most recent peer. So, is it worth donning the cape and saving Gotham once again? It’s worth pointing out straight away that this is exactly the same game that was released on Xbox 360 and PS3 in 2012, and features none of the DLC that was available on those platforms. Far from being a definitive edition, LEGO Batman 2 for Wii U features only minor GamePad usage and is largely left as it was a year ago. That said, it remains fun to play, and hasn’t lost any of its charm over the past year. Much like the first LEGO Batman, the sequel features an original story, this time expanded out to include the entire DC Universe, with a focus on the Justice League itself. Joker is up to his old tricks again, escaping from Arkham Asylum and disrupting the Man of the Year awards ceremony, where Bruce Wayne has beaten Lex Luthor to the title. After seeing Joker and his associates’ wanton destruction, Lex vows to team up with the maniacal clown to secure his Presidential election. 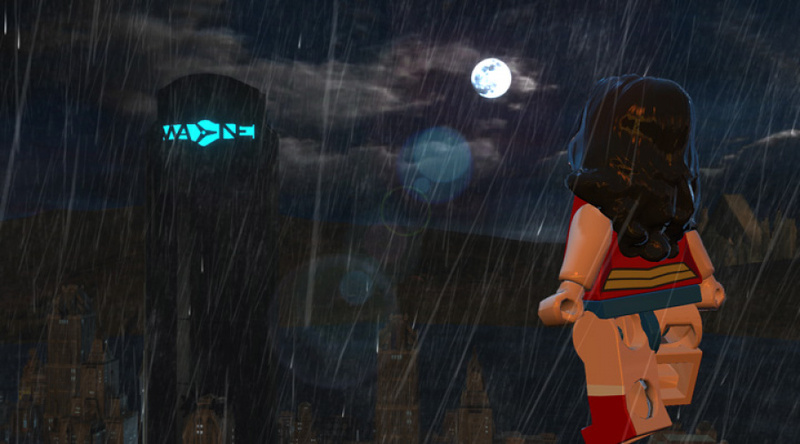 The game’s fairly random plot funnels you between various areas of an open-ended Gotham, something that adds a huge degree of exploration that LEGO games rarely have. 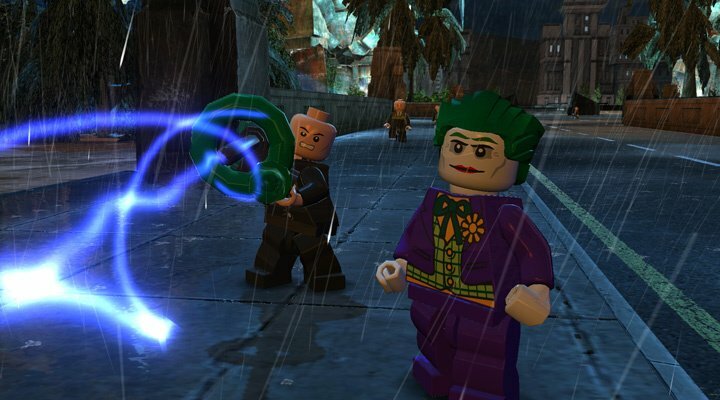 While the main campaign will only take around seven hours to complete, LEGO Batman 2’s Gotham hub is left largely unexplored, leaving you with hours of content at your fingertips post-game. Collectibles are scattered across the map, with characters in particular needing to be tracked down and beaten before being available for use, and your method of exploration is very much left up to you. Though once you’ve mastered Superman’s flight controls, there really is no alternative. It’s easy to draw a comparison with LEGO City Undercover here – both feature expansive hubs, and while Gotham isn’t quite as vibrant or as detailed as LEGO City, it remains an interesting area to explore. That’s not to say that the game is lacking graphically, in fact it looks great and portrays its LEGO building blocks well, but it is clear that it uses none of the Wii U’s additional power, missing out on the more subtle effects that made LEGO City Undercover look so good. Which brings us to the first major addition that the GamePad introduces. While it will be seen by many as lazy, the GamePad is used almost exclusively as a map screen whilst in Gotham, giving you an overhead view of your surroundings. Far from being needless, it makes exploration manageable, thanks in part to custom waypoint beacons, allowing you to track down every last collectible with ease. 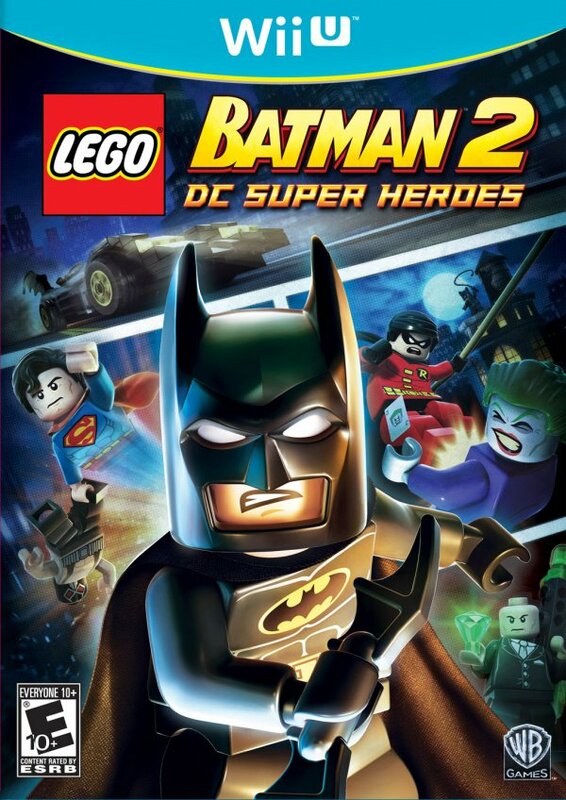 Of course, the main gameplay is to be found in the missions themselves, and it’s here that LEGO Batman 2 becomes something of a mixed bag. Spread over 15 levels of varying length, the campaign features the tried and tested LEGO formula of games past – go here, smash everything, solve a puzzle. The inclusion of suits for Batman and Robin, bestowing them with all manner of powers, means that there is always a slight tactical element involved in the gameplay, and the addition of Superman’s flight ability adds a vertical element to the level design. The LEGO series staples of stud and mini-kit collection remain, while the new ‘Citizens in Peril’ feature introduces another item for you to hunt for, nudging you ever closer to that elusive 100% completion. The simple fact is, though, that while smashing everything in sight gets tiring quickly, you rarely get to a point where the game simply becomes boring – it might be formulaic, but it is still fun. In an attempt to change the pace of smashing bricks, levels are occasionally broken up by on-rails sections, be it in the air as Superman or racing around Gotham in the Batmobile. While these levels are fairly infrequent, they are simply not as fun as the regular levels and descend quickly into holding the fire button and waiting for the enemy’s health to drop, especially when using the invincible Superman. Aside from the very end of the game, three characters are all you get for the main adventure; which that may appear to be limited, when coupled with the various suits, it makes for a fairly open selection of powers and puzzle opportunities. In an attempt to help you handle your team, the GamePad allows for touch-screen character swapping, which while a nice idea, is rarely any use and in fact slower than using the trigger buttons in all but the final level. The lack of a coherent use of the GamePad is something that plagues the game throughout the parts of the campaign where a map simply isn’t needed, and it’s clearly something TT Games has struggled with. For reasons only it knows, cutscenes are run on both the TV and GamePad along with random audio snippets, as are vehicle selection screens, something that LEGO City Undercover already showed worked best as a GamePad feature; it all adds up to an un-directed GamePad experience, and with no Pro Controller support, it is unfortunate that it isn’t put to better use. Off-TV play also exists, at the cost of a valuable map screen while in Gotham, but it works very well and feels like a game that was designed to be played this way. The GamePad does, however, come into its own in multiplayer, with the second screen allowing for each player to separate in co-op. Gone is the dynamic cut down the centre, replaced by one player on the GamePad, and another on the TV with a Wii Remote and Nunchuk. While missions will bring both players back together, exploration around Gotham can be done separately, and with a screen each, this allows for a much larger area to be covered. LEGO Batman 2 also features a notable soundtrack, with Danny Elfman’s Batman theme and John William’s iconic Superman theme adding a touch of nostalgia and grandeur to the gameplay. The inclusion of voice acting also allows for a far funnier story to evolve, but it never quite reaches the comedic heights of LEGO City, something that is emphasised by the jarring silence from the characters during levels. If it wasn’t for LEGO City Undercover, LEGO Batman 2 would easily be the pinnacle of the LEGO games series. It’s a hugely ambitious title that, while sticking to the principles of the series, takes chances in its design to make it feel fresh. But it is a game that is now a year old with only a handful of meaningful improvements, and a bespoke Wii U LEGO title that improves upon almost everything is now available; as a result it's hard to wholeheartedly recommend it. There’s certainly a lot to enjoy here, but the series has moved on and improved in the year it's taken this port to arrive, so it doesn't have the shine it once did.. I couldn't agree more with the conclusion. If we didn't have Lego City, which I think is great fun, I might have considered picking this up. Instead, I'll just pass. i'm burned out on lego games for now. 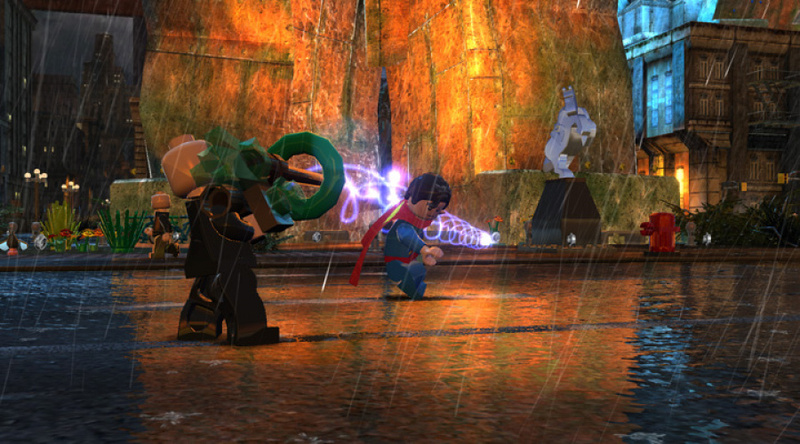 Plus, the brand-new Lego Marvel game is due later this year. Too bad this wasn't ported as a Wii U launch title - it looks good to me, but the timing is unfortunate, especially since the PC Steam version is just $7.50. Can't wait for Lego Marvel Super Heroes. I just hope LEGO Marvel has GamePad co-op a la this game. That feature alone for co-op games would make a great selling point for WiiU! I'm just waiting for LEGO Marvel Superheroes. I'ld buy it just for the off-screen mutliplayer. And the fact that Lego City somehow doesn't even have multiplayer. I think that's a very important fact that needs to be pointed out in comparing the 2 games. My wife is getting nausea playing LotR on the PS3 w/ that dynamic screen split spinning round and round. Don't know why they just couldnt' have made it split screen. If Lego Marvel has the same 2nd player off-screen it becomes a must buy. Man I must type slow, onex said that 16 minutes ago. I like it. Superman and the John Williams score... awesome. The Justice League, great. But why so late game? It's disappointing that many of the characters are reskins of one another. I LOVE the 1st Lego Batman. The unlockable characters were more fun to use. I give you Poison Ivy as just one example. In the 1st, she blew a poison mist from her mouth, but even better, she had the hilarious 'kiss of Death that never got old. Look how absolutely dull she is in the 2nd. And it was also pretty neat in the 1st to replay all the levels from the villains perspective. I don't know if the Wii-U roster basically matches the other consoles, but it was easy to see DC Super Heroes was kind of rushed. The 3DS version has a superior roster.. 85 characters I believe. Year old port with no DLC. How many times will this happen. I will not buy and inferior copy if an old game for more money. I'm enjoying it okay, but like Lego City I get the feeling I'm missing dialogue in cutscenes where I see character mouths moving, but hear no sound - anyone else getting this? No pro controller support! Ha ha ha hwa hwa hwa ha! @Sean_Aaron Ya! I'm getting that feeling with the 3DS version tho. @Nik-Davies - Thank you very much, we're about 1/2 thru the game so still plenty of time to save my wife's stomach. I'm going to go set it now so I don't forget later. Couldn't agree more, why they couldn't make it a speacial edition like Mass Effect 3 is beyond me. I have two choices with this one then, wait for inevatable price drop or buy the Wii version for half price!!! I really enjoyed the game on the Wii, but I cannot justify buying it again for the WiiU. However, the co-op separate screen seems fantastic so me and my lil' punkin' can play together. I hope the Marvel game does this as well as I will definitely be picking up that one. Sorry, but this is better than Lego City! Way better!! I really love the Lego games. They remind me of the good old "collect a thon" games from the N64 era Although i have to say, i felt a bit...underwhelmed after playing LEGO City Its not a bad game by any means, but LEGO City was SO damn good, its almost impossible to reach up to it. Will grab it once it hits bargain/sale prices for the kids. I've been considering picking this up because I enjoyed Lego City so much and it seems that this is the next best thing. I'm not sure about the price though as I've already bought the game on Wii and DS for my kids, so $50 for offscreen/multiplayer/HD seems a bit steep. The only problem is that this is pretty much not that different to the first one, trying to get the right costumes for Batman & Robin, with Superman coming very late in the game, and other characters (such as Flash, my favourite) only playable in free mode. Well I can get the PS3 version for $23 but the Wii U version is $68. I will wait for price drop. True, if you port a year old game, it needs to be the definitive version, especially since you're selling it at full price! I figured out my audio issue: had the Wii U TV audio set to surround sound, but I have a 2.1 speaker set-up. I had thought it would automatically downmix rather than simply lose the channel, but I think it's because I have a power amplifier rather than a surround-enabled receiver, d'oh! Game is decent so far, but I really hate the dynamic split screen and the way it's done as a diagonal. Totally makes me motion sick, so I have to limit multiplayer sessions. Another old childrens game....... just what Wii U needs. @Razalom Wii version is cheap. Would have got if it had Pro Controller support on multiplayer but do not like Wii Remote and Nunchuk control method. Really? After making Undercover they couldn't make better use of the Gamepad? Undercover was awesome. Except for not having 2 player. This has co op but I think I will wait for the Lego Marvel game and see if that game fares any better with a Wii U version. Late ports should be much better. For £10 as a download, I'll take it. That and Arkham City for £12:50 there are some benefits to owning a console that's not selling so well just at the moment, hopefully sales will pick up from tomorrow.